Mehndi event is a way to celebrate the wedding ceremony with joyful melodies, rituals, songs and beautiful dresses. 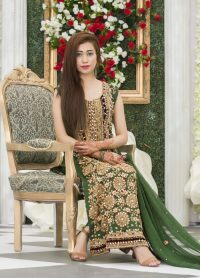 The most traditional function in Indian & Pakistan is Mehndi and Yellow or Green is known as the main color for Mehndi dresses. 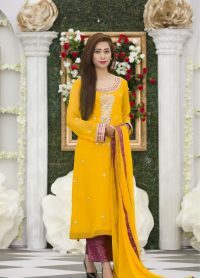 Usually, a yellow color is worn with the green combination but nowadays trend in changing day by day and girls prefer Yellow with some multi-color combinations. 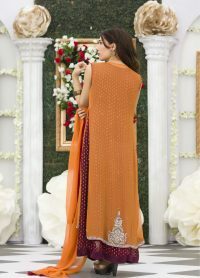 Exclusive’s Indian Mehndi dresses are trendy; their modern cuts are spiced up with unique embellishment to create a modern dress. Exceptional and jazzy dresses with multi-color hues are making these Indian Mehndi dresses classy and eye catching. Embellishments on these dresses are done with hand embroidery, gotta work, and block printing. 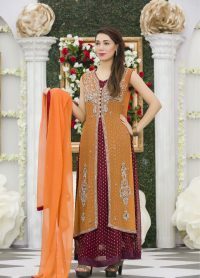 Exclusive’s Mehndi dresses are having magnificent style adorned straight shirt with Cigar pants. Khaddi net, Cheffon, Shamooz, banarsi and other some latest fabrics. Our collections consist of fancy new style A-line shirts, Long Shirts, Anarkali Dresses, Frocks, Salwar Kameez and Churidar Pajamas. 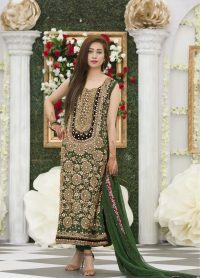 Mehndi dresses with high-class fashion and inspiring design will look entirely different on your big day. Buy now as these contemporary cuts, dynamic colors and amazing fabrics is just what you need for your big day.